*This piece was recently featured on Scary Mommy, re-titled as 10 Pathetic Ways Moms Spend Alone Time. You can check it out here. Your spouse took the kids out of the house for an hour, and you find yourself inside, alone. With no children needing you. 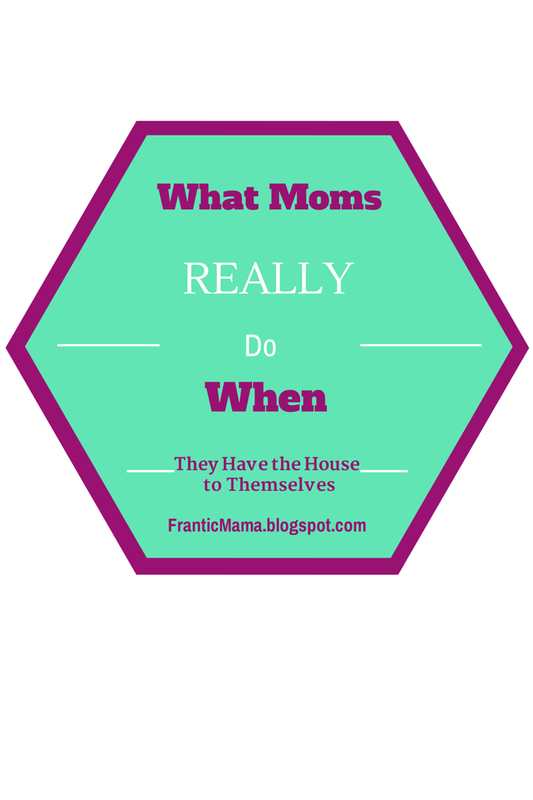 What's a mom to do? Mothers learn quickly how precious alone time is. Then, inexplicably, when blessed with such a gift, it can be difficult to decide on the perfect way to spend it. Chores? Rest? Exercise? Bathe? 1. Sheepishly call out "Bye!" to your kids and husband as they get in the car. Feel a little guilty, then shut the door. Start feeling better. Take a deep breath. What to do? you wonder, looking around the house, noticing toys scattered on the floor, breakfast dishes out, laundry to be washed. 2. Shower? No, you can't waste alone time on that! Nap? You can't sleep through this time either! Laundry, you decide: I'll throw in a wash, and then I'll sit down and check my e-mail. 3. But first, you decide to pee alone. With the door open. 4. You start the laundry and notice the threadbare gym clothes you are currently wearing. You consider putting in an exercise DVD or going for a run but decide you can't possibly waste this precious hour on exercise. 5. Your stomach grumbles, so you go to kitchen and stare at the open fridge. I need a quick piece of leftover birthday cake to enjoy with my cold coffee, you decide. 6. Decide that now you'll take a quick look at your computer to check e-mail and pay bills. Sit down and open laptop. ...25 minutes later... Argh! I just wasted 25 minutes scrolling through Facebook and looking at recipes I'll never make on Pinterest. 7. You find yourself aimlessly wandering the house only to end up in the bathroom, plucking stray gray hairs from your roots. 8. You call your mom to tell her you have the house to yourself but quickly realize time is ticking away while you talk on the phone. Your heart thumps. 9. Hurry, you think, I must do something productive. You frantically eye the crumbs covering your sticky kitchen counter top, and you spray it down. You begin feeling productive again. 10. Looking at clock, you ask yourself, I deserve some rest, don't I? so you grab an unread magazine that arrived in the mail three months ago, and sit down on couch. Exhale. Open magazine. ...2 minutes later... Door opens. "Mom, we're home!" Let's Connect: Facebook, Twitter, Pinterest, Google+, & Instagram.